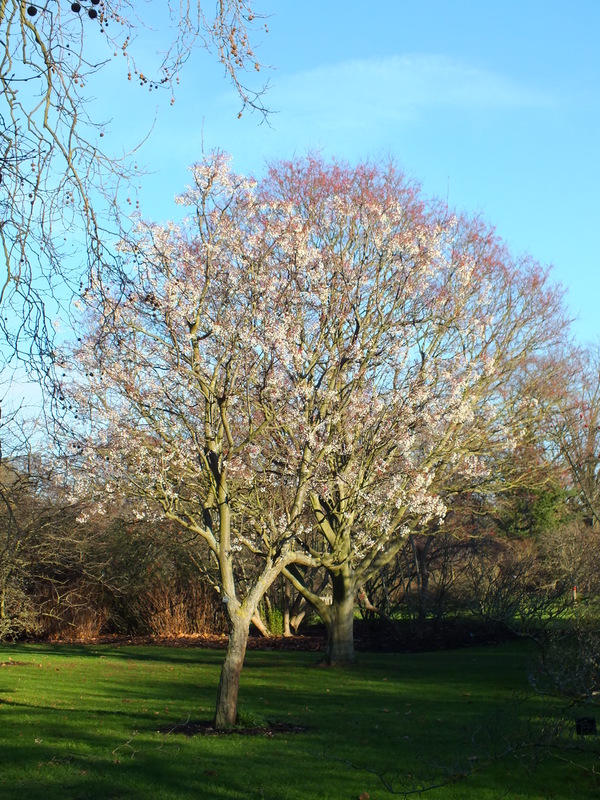 I’ve come across Sorbus glabrescens in the Arboretum at RHS Wisley and here it is again, full of fruit, at Kew, side by side with the red berried Sorbus alnifolia. S. alnifolia is a prominent feature of the Japanese Landscape, framing the temple building, Chokushi-Mon. 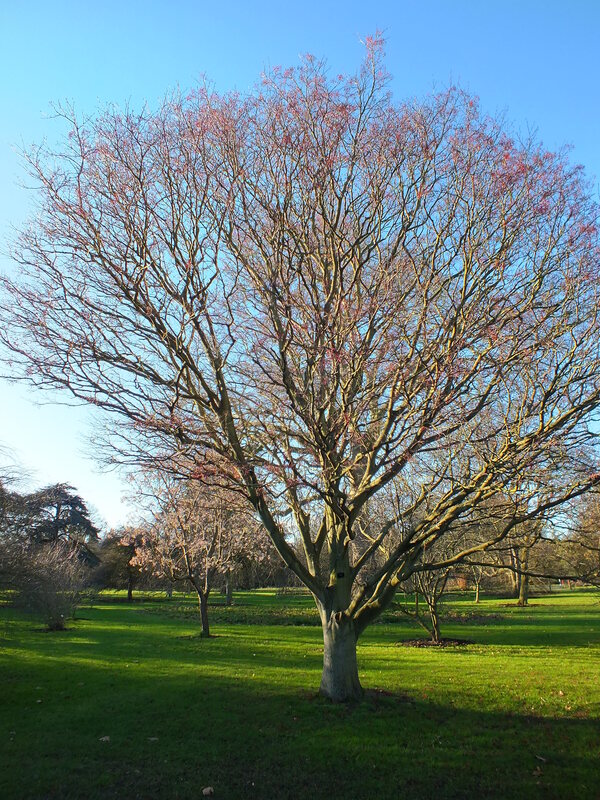 Spring blossom, some stunning autumn colour, white, pink and red berries (pomes actually), delicate leaves – this diverse group of trees has a lot to offer. Best grown in moist, acidic, well-drained soils in full sun. As the common name suggests, this is a tree of cool mountain climates that dislikes hot and humid summers. It will not grow well the hot and humid summer conditions south of USDA Zone 7. Somewhat intolerant of urban pollution. Generally requires little pruning. Prune from late fall to early spring if needed. 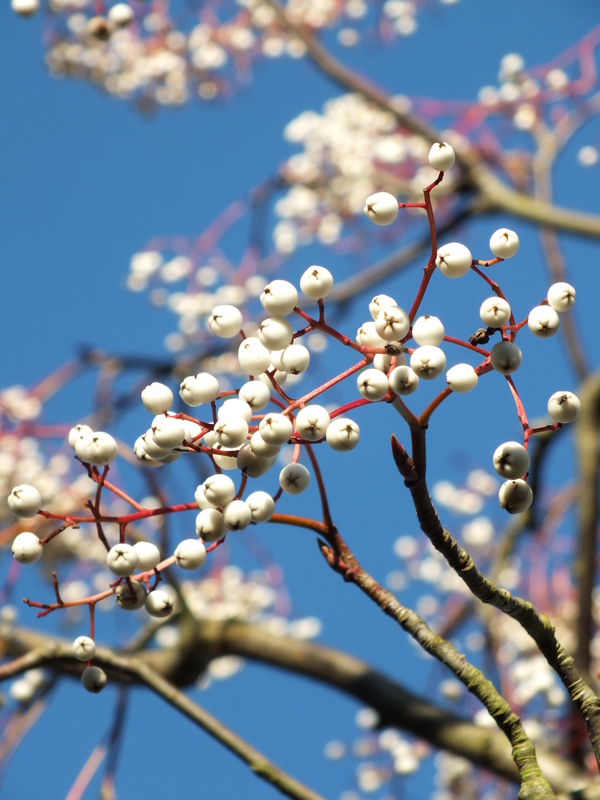 Korean mountain ash is a small, densely-branched, deciduous, ornamental flowering tree of the rose family that is noted for its attractive form, creamy white flowers, simple beach-like leaves, red fall fruit and good fall color. It grows rapidly to 40-50’ tall by 25’ wide, with a pyramidal shape when young that rounds with age. Smooth, gray, beech-like bark is quite noticeable in winter. Dense flattened corymbs (to 3” across) of 6-10 small 5-petaled white flowers appear in May. Flowers are followed by pink to orange to scarlet berry-like pomes (to 5/8” long) that ripen in fall and remain on the tree even after leaf-drop. Ovate to lance-shaped, glossy, toothed, dark green leaves (to 4” long) are simple (leaves of most other species of mountain ash are compound). Golden orange fall color can be outstanding. Alnifolia means alder-like leaves (Alnus is Alder genus and folia means leaves). Mountain ashes usually have ash-like leaves (except this one), but are members of the rose family, and are not related to true ashes (see Fraxinus of the olive family). On the plus side, Korean mountain ash is noted for its resistance to borers that attack other species of mountain ash. It is considered to be one of the best of the mountain ashes because of its pest resistance and form. However, bacterial fireblight can be a severe problem, causing scorched leaves at the branch ends. Scab can cause significant defoliation. Cankers, crown gall, powdery mildew and rust may also occur. Insect visitors include aphids, sawfly and scale. Stressed trees are generally more susceptible to attack from canker and borers. Lawn specimen or small shade tree for cool northern climates. The fruit can be used to make Rowan Jelly – with the addition of a few crab apples – as the fruit ripens (early Autumn) and no doubt there are many recipes for this on an Internet..